The island of Sri Lanka is approximately 67,654km2 (6,765,400 hectares). This island was repeatedly separated and connected to the southern tip of India during interglacial periods yet the island’s fauna and flora shows a high degree of endemism. It was estimated that some 25% of the island’s original vegetation remained fairly intact; one of the most prevalent ecosystems on the island is the mangrove wetland systems. The island of Sri Lanka has several extensive coastal wetlands with rich mangrove forest in past. Most of these wetlands were covered with mangrove ecosystems of various mangrove plant species. All of which show high Net Primary Production (NPP) potential, (2008). Current rates of mangrove destruction are roughly estimated at around 150,000 hectares (370,050 acres) per year, or about 1% per annum, according to the United Nations Food and Agriculture Organization Almost 225,000 metric tons of carbon sequestration potential is lost each year with current rates of mangrove destruction. 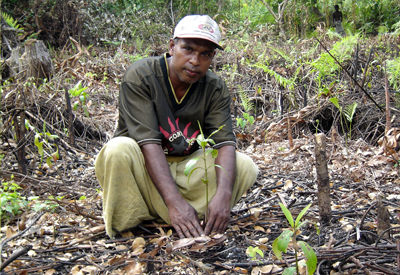 More than 50 % of the Sri Lanka Mangrove forests have been destroyed irrecoverably in the past 30 years through deforestation, abuse and exploitation – with negative impacts on fishery and the protection against catastrophic flooding events. Mangroves are among the most valuable coastal ecosystems. They provide habitats for species of marine fauna and flora, especially breeding and nesting grounds for fish, along with food and livelihoods for local communities. Very importantly, they can provide protection from the impacts of climate change, including sea-level rises and coastal erosion caused by storm surges and extreme weather events. 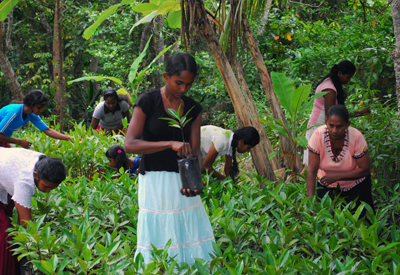 Because of their importance, several community-based mangrove restoration projects have been implemented in Sri Lanka aimed at protecting and rehabilitating this all important ecosystem. 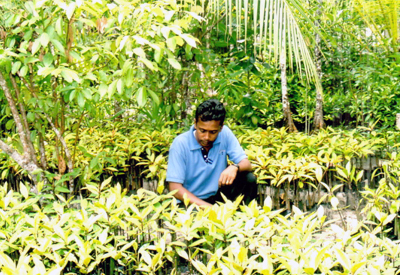 Sound mangrove management can provide adaptation strategies such as increasing resilience of the coastal line and its inhabitants, as well as providing new livelihoods options to the local communities.